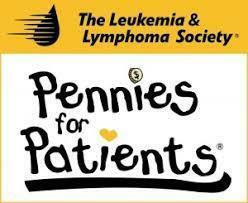 January 18th - February 8th Stony Brook Elementary, Bear Tavern Elementary, Hopewell Elementary and Toll Gate Grammar will be joining forces to support the Leukemia & Lymphoma Society by collecting donations for the "Pennies for Patients" campaign. Schools will have collection buckets available for each grade level team. After the collection period is over, we will have the coins counted and the grade level totals will be revealed. There will be a fabulous prize for the grade level that has the highest total. The donation period will take place between January 18th and February 8th. During this time, we have a few fun activities lined up for the students.